If you work in a warehouse where lots of plain wood pallets get used and then thrown away, you can actually do good for yourself and the environment by recycling and repurposing those pallets. Have some projects around the house you’ve been waiting to start? Do you have new furniture on your wish list but are limited to a tight budget? Simple DIY pallet projects may be the answer! 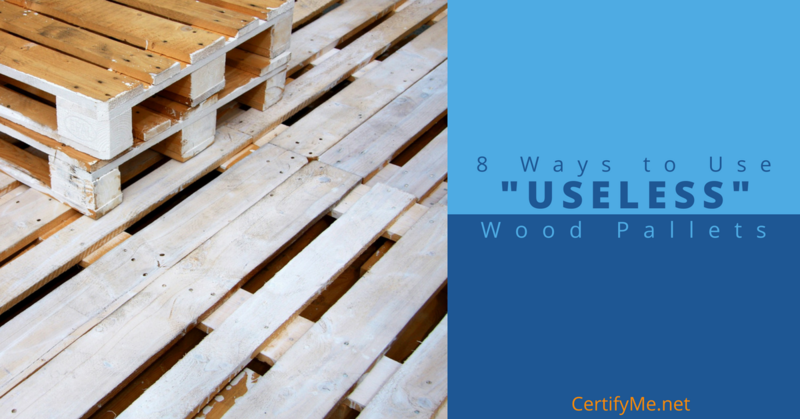 Certify Me offers 8 great ways to use old, reclaimed pallets around the home to create something totally unique, functional, and budget-friendly! Headboards can be expensive items, but they add so much to a bedroom and help to make the end the focal point. 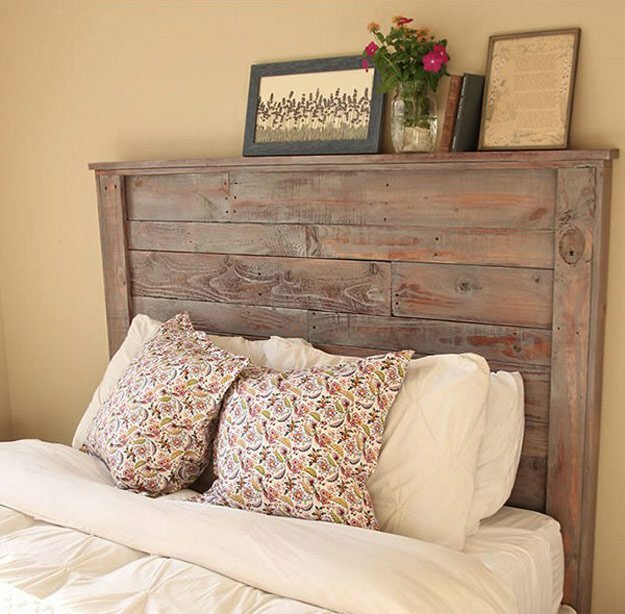 Build many different headboard styles with upcycled pallets to inexpensively transform your bedroom and the guest bedrooms in your home. Simply sand down an old pallet and then stain or paint it and attach to a bed frame, or get a little bit more creative with different styles. Use a stencil or decal to create a fun design or keep it simple and chic by painting it white and lightly distressing it to create that farmhouse look. Create a wine rack using an old pallet to organize or display your wine collection while finding a safe place to hang your wine glasses. Wine racks are easy to customize to match your style and can be any size you want for this fun and easy DIY pallet project. Hang the wine rack in the kitchen or dining room for an attractive display, or hang it in your pantry to keep your wine off the floor and save space. If you’ve been wanting to grow your own vegetables at home, but are limited on space, you can grow a variety of produce in a small area with a DIY wood pallet vertical garden. Grow lettuce, kale, tomatoes, herbs, and more! Secure the pallet garden to a fence or other sturdy structure and make sure it’s in a sunny spot. 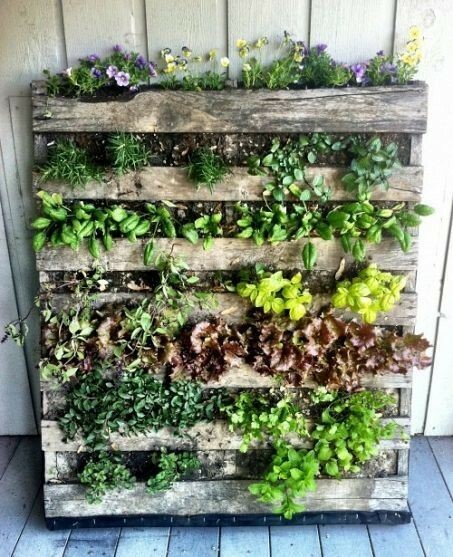 Place veggies and herbs in hanging pots or use the slats in the pallet as garden beds and fill with soil. A bench is a pretty piece that adds function to an entryway, mudroom, or bedroom. Create your own custom DIY wood pallet bench and stain or paint it to reflect your home’s style. The daybed is a smaller version of a couch that serves as the perfect place to plop down in the afternoon or evening and relax. A popular place to put a daybed is in a sunroom or covered porch to create a serene oasis. 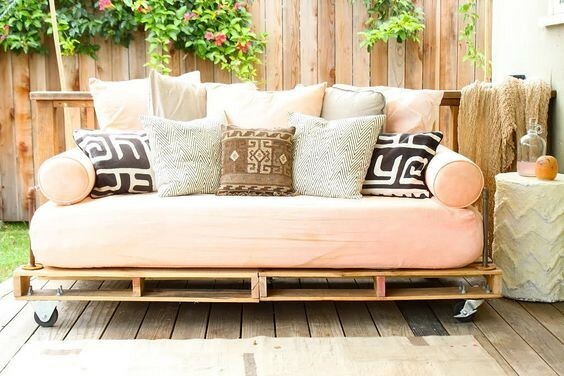 Use reclaimed pallets to build the base and backrest for the daybed, and place a mattress as the seat cushion and add comfy pillows. Pallets allow you to transform your backyard with a cheap solution for seating and even decking. If you don’t have a place to set chairs or a table in your backyard, don’t call the local contractor. Save tons of money and time by laying pallets horizontally to create a deck. Next, repurpose old pallets to build outdoor seating for your porch or deck. Add comfortable pillows and relax in your DIY pallet chairs! Reenergize your living room with a new coffee table to add rustic or elegant style using an old pallet. Stain it, paint it, or do both for a unique dual toned piece. You can add additional storage in your living room by creating a shelf underneath the coffee table that holds remotes or board games, and by building boxes to hide toys, extra pillows, and blankets. 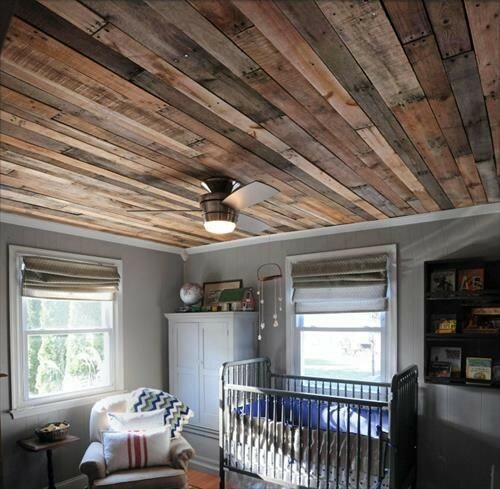 Create an incredible feature in your home by installing a variety of old wood pallets side by side on a ceiling. Get that pricey “Fixer Upper” look without the large price tag! Pallets offer the ideal solution for wall shelving. Add more organization and a decorative element by creating an open shelf using wood pallets. Add additional décor to your home by creating a unique wooden piece of art with a favorite quote or monogram, or a trendy arrow sign to add to a gallery wall. Your imagination is the limit when it comes to using upcycled pallets for a number of unique DIY pallet projects!